Flanker Justin Tipuric says the pressure for the Welsh regional derbies over the festive period has already started to build. 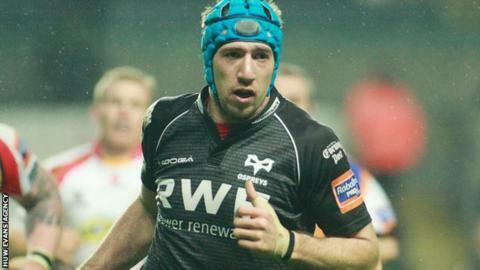 The Wales forward will play for the Ospreys in the annual Welsh derbies around Christmas and New Year. Tipuric knows how important the Welsh derbies are to supporters and players. "I am a local boy and you don't want to be going into your local area getting abuse about losing a local derby," said Tipuric. "It is important for us and important for the fans and for the coaches. "We just want to continue to play well now. There are a few derby games coming up and you know how much that means to the fans. "It means quite a lot to the players as well." The British and Irish Lion expects Welsh rugby's derbies to be typically raw and full-blooded occasions played in front of big crowds over the holiday period. Ospreys kick off the Welsh regional derbies when they travel to face big city rivals Cardiff Blues at the Arms Park on Friday, 20 December. The region then face the Scarlets in the first leg of the west Wales derby at Parc y Scarlets on Boxing Day before hosting their rivals at the Liberty Stadium on Friday, 3 January. The first of the double-header between Newport Gwent Dragons and the Cardiff Blues is at Rodney Parade on Boxing Day with the second leg on New Year's Day at the Arms Park. Tipuric, 24, was in school when Welsh rugby switched from its professional clubs in favour of regions back in 2003. He remembers the old Welsh club derbies between Llanelli and Swansea, but believes the regional derby between the Scarlets and the Ospreys is gaining a similar reputation and status. "I think it's starting to come back," said Tipuric. "As a boy I used to go and watch Swansea versus Llanelli and it was really important. I used to be absolutely devastated going home if we had lost those games. "It's the same now, with the boys coming through, and its starting to rub off on how much that win means for them. "When you are a fan, it does mean a lot to you. Quite a lot of the boys playing now are fans of the Ospreys and it means just as much to us as it does to the fans."